Yemeni theater was awaken last week by the play “ The Imaginary Invalid “ held for two consecutive nights in Sana’a at the Yemeni Cultural Center, in cooperation of Ministry of Culture, the French Cultural Center and Theatre revival of Everi - National Center for Drama in France. The play is one of the most notable plays of the French playwright Molière. It was performed in Arabic and completely performed by Yemeni actors and actresses. The play wowed the audience by its actors and actresses’ comic and sophisticated performances. The Yemeni effect gave a unique taste to the overall atmosphere, leaving the audience to have a maximum entertainment. Days before performing the play, a press conference was held to introduce the director and the whole team behind the play. Adel al-Hakim, the play’s director expressed his delight to be part of this project that has been working on since six months. “The initial idea came from the French Cultural Center and many discussions followed with the ministry and finally we started working on the project six months ago. Here we are today, witnessing its debut,” said al-Hakim. 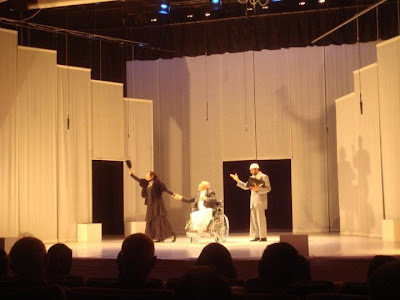 Zaid al-Faqih, the Yemeni Cultural Center’s manager, described performing the play in Arabic, in Yemen and with a full Yemeni cast, an embodiment of the long and deep relationship between Yemen and France. “This tells about how strong bond we have between us and France and I want to take this chance to thank the French Cultural Center for all their efforts,” al-Faqih said. Theatric movement in Yemen is having shy steps but it seems a strong movement is in its way. “Regardless of the obstacles we faced, we are hoping that the audience will love the play and always ask for similar performing plays. Of course, we will do our best to meet audience’s demands. On the other hand, we are considering to perform the play in neighboring Arab countries as well. That’s very possible,” said Joël Dechezlepretre. The originally French play, Le Malade imaginaire, is a three-act comedy by the French playwright Molière. It was first performed in1673 and was the last work he wrote. In an ironic twist of fate, Molière collapsed during his fourth performance as Argan on 17 February and died soon after. The original play included dance sequences and musical interludes that Marc-Antoine Charpentier composed.